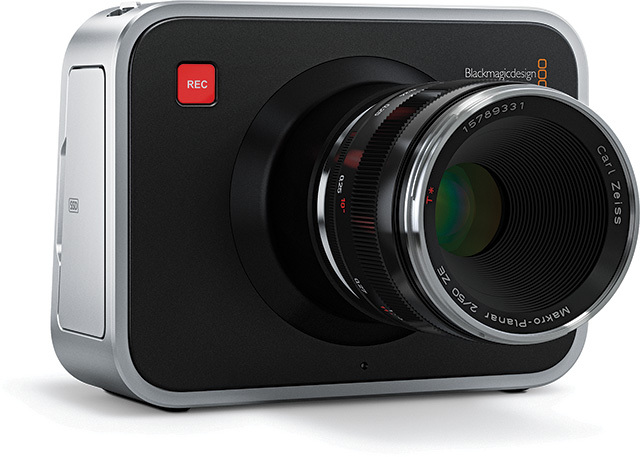 Blackmagic Design just announced that they lower the price of their Cinema Camera to $ 1,995. Thats a $ 1,000 drop. The Blackmagic Cinema Camera is available in either EF or MFT lens mount models. Super wide 13 stops of dynamic range allows capture of increased details for feature film look. High resolution 2.5K sensor allows improved anti aliasing and reframing shots. Built in SSD recorder allows high bandwidth recording of RAW video and long duration compressed video. Open file formats compatible with popular editing software such as CinemaDNG 12 bit RAW, Apple ProRes and Avid DNxHD. No custom file formats. Includes no custom connections. Standard jack mic/line audio in, BNC 3 Gb/s SDI out, headphone, high speed Thunderbolt I/O technology, LANC remote control and standard DC 12-30V power connection. Capacitive touch screen LCD for camera settings and “slate” metadata entry. Supports 2.5K and 1080HD resolution capture in 23.98, 24, 25, 29.97 and 30 fps. Thunderbolt connection allows direct camera capture via included Media Express software and supports live waveform monitoring via the included Blackmagic UltraScope software. Includes a full copy of DaVinci Resolve color grading software. The official release of Lightworks will be soon. At NAB 2012 Editshare announced 28 May 2012 as the official release date. Lightworks Pro is available to educational users for $30 per year. We wish you a merry CineGear-christmas!